You Told Us: Should the Natural History Museum Expand into a Public Park? The museum is planning an expansion, which some locals support and others vehemently oppose. 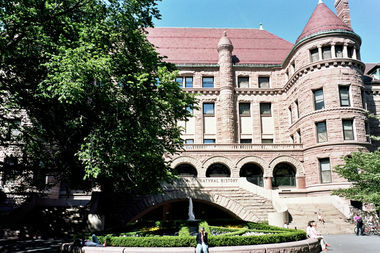 UPPER WEST SIDE — The American Museum of Natural History announced it would add a new science center at the end of last year, but it wasn't until this summer that a group of neighbors opposing the expansion organized against the plan for encroaching on public green space. The 218,000-square-foot Gilder Center for Science, Education and Innovation would expand into the adjacent Theodore Roosevelt Park, a move members of the group Defenders of Teddy Roosevelt Park Inc. strongly oppose. After the group hosted a town hall this month, we heard from residents on all sides of the issue — from fans of the project to those who want it scrapped altogether. ► "Central Park is just a step away. It is not like this is the one spot of greenery in the area," wrote one user on Facebook. ► "I live just around the corner and we have the entire Central Park at our disposition. Also, there are many other green spaces in that area. Don't forget that only a couple of blocks away we have the Riverside Park too if we want more green to sit on ..." another wrote. One person described the museum as "a national treasure" and "a prime jewel in the City" that should be allowed to expand, according to a discussion on Neighborhood Square. But others called the green space within Theodore Roosevelt Park "irreplaceable" and not comparable to the larger neighborhood parks. ► "With all due respect to commenters who cite the proximity of Central Park to Theodore Roosevelt Park: It's apples and oranges. Following such 'logic', it would be logical to tear down all the little churches that are close St. John the Divine and other cathedrals. As the neighborhood 'village green', Theodore Roosevelt Park is as much an institution as the museum itself..." said a Neighborhood Square user. ► "I am opposed to the expansion which comes at the expense of the park. The museum is a great treasure. However our green spaces have been shown to be irreplaceable. Brick and mortar can be had elsewhere. Please keep our community as green as possible," another Neighborhood Square commenter noted. ► "I have mixed feelings about this.... I feel the neighborhood is congested enough and the addition of a bike lane makes it dangerous for pedestrians and bikers now also. I like bench sitting in the precise area where this new building is planned because it's quiet. Yes the other parks are accessible but, they're crowded too (it's tough enough to bicycle through approved lanes in either park) and this lil park is a rescue site for me," a Neighborhood Square user wrote. The commenter continued with this suggestion: "I would repurpose a wing inside the main buildings instead of expanding outside." A museum spokesman told DNAinfo that building the proposed center away from the museum's main campus was out of the question. The next step for the plan is a decision from Community Board 7, though the proposal has not yet been calendared by the board.